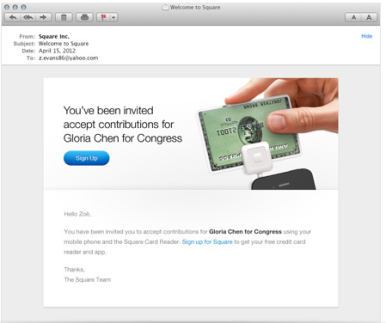 With the 2012 election campaign heating up, Square on Friday added a new feature to its iOS-based card-reading system: The ability to make and collect campaign donations. Square CEO Jack Dorsey announced the new feature via Twitter, touting it as compliant with federal fundraising laws enforced by the Federal Election Commission. Using the card-reading device that attaches to an iPhone or iPad, candidate can accept on-the-spot donation at rallies and appearances—and Square’s new fund-raising feature allows campaigns to collect FEC-required information on a donor’s name, address, occupation, and employer. The collected funds would be available for a campaign to spend the next day, the company said in a press release. Campaigns can also use Square’s dashboard to track contributions and manage contributor information, the company said, while designating which staffers have access to the . It did not indicate whether Square would collect its customary 2.75 percent-per-swipe fee on transactions. Campaigns have grown increasingly sophisticated about using online resources in recent years; Barack Obama’s 2008 election campaign, for example, collected nearly half-a-billion dollars from online donors. The iPhone was an infant during that cycle, though, and the iPad didn’t even exist. But now both Obama and his Republican challenger, Mitt Romney, have already started using Square to collect donations in this cycle. Friday’s announcement opens up Square’s services to federal candidates of all stripes. Users must register with the company in order to receive the card readers, which plug into the audio jacks of iPhones and iPads. The app itself is free, and compatible with all devices running iOS 4.0 or later.